Jessica Wohl’s Love Thy Neighbor grapples with the fear, intolerance, and polarization the artist sees dividing communities and cities across the country, and answers those divisions with objects that evoke empathy and comfort. 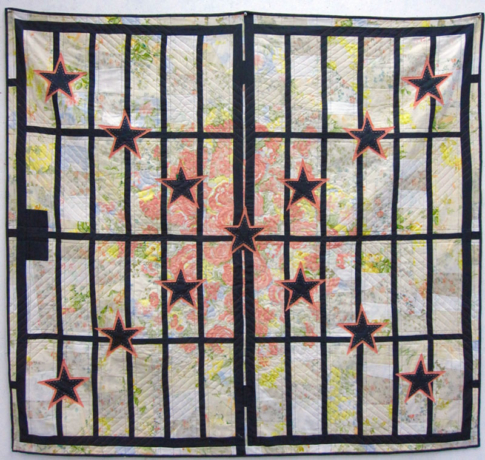 The patterns of Wohl’s quilts invoke the fences, gates, and security bars that divide us, both from one another and from that to which we aspire. Quilts bring together disparate pieces, and so the medium in which these objects are rendered responds to that division. The quilts in the exhibition are stitched together from fabric found or purchased from thrift stores and yard sales across the country. For Wohl, the fabric pieces “are hand-me-downs, throwaways, stained, smelly, loved, discarded and Someone Else’s. They are Others that become one.” Please note that the UAG is closed during academic breaks.